6:14 And King Herod heard, because his name became apparent. and through this, "powers" are working in him. 6:15 Yet others were saying he is Elias. 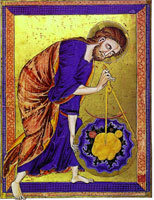 yet others were saying a prophet, like one of the prophets! 6:16 And having heard, Herod was saying ... John, whom I beheaded, this one was raised. 6:18 For John said to Herod ... It is not permissible for you to have the wife of your brother. and he gladly heard of him. the king said to the maiden ... Request whatever you want of me and I will give it to you. 6:23 And he swore to her ... Whatever you ask me, I will give to you, up to "half my kingdom." 6:24 And having gone out, she said to her mother ... What should I ask for? And she said ... The head of John the baptist. she requested, saying ... 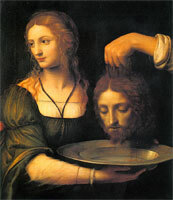 I will forthwith you give me the head of John the Baptist on a platter. because of the oaths, and the ones lying up, he could not refuse her. and going away, beheaded him in the watch. and the maiden gave it to her mother. and they placed it in a "memorial vault."